As you can see from the cover art this is a collection of short science fiction stories that are not exactly of the serious hard science fiction type. It’s summer after all. The first two are about scientific experiments gone wrong. The third is a quick visit to a psychiatrist. And the last one is a very retro pulp adventure. However, if I had read these short descriptions I might have skipped the third one, which is now my favorite. The book opens with Professor Deakins’ Magic Box. The protagonist, however, is a Science Correspondent who has to write an article about Deakins’ latest discoveries. The second story, Jumping the Streams, also has reporters who are interested in scientific stories. Actually, they challenge the protagonist scientist to travel in time. He has already made some amazing discoveries but eventually decides to travel to some parallel universe rather than to another point in time. Parallel universe stories often deal with social alternatives (either utopias or hellish distopias) or with personal choices and second chances. That’s not the case here. The theme in this case is that the changes are too subtle. That might be a very interesting foundation for a longer story but for a short I found it, indeed, too subtle. The Boglet, as it is often the case with short stories, only shows its true strength in the last three sentences. And they made me laugh out loud. A guy goes to a psychiatrist because he is seeing things. There is a small malevolent creature – the eponymous boglet – tormenting him, completely spoiling his life. The author narrates with such detail what the boglet does that we have no real reason to believe that it is actually a figment of the patient’s imagination. And then those three sentences come. The final story is the longest, it has less humor and more adventure. Twist Stiffly and The Hounds of Zenit Emoga reads like one of those stories from the early 20th century: a brave hero, his loyal sidekick, a lovely damsel in distress and, of course, an evildoer. Their rocketship is the Raging Comet – it should have one of those covers. Anyway, after seeing the actual cover you can’t be surprised that the hero’s sweetheart is named Ruby Lipgloss. Unlike the previous three, this one does not end with a humoristic twist but rather with the heroes flying to their next adventure as if this were just one more chapter in a larger story. 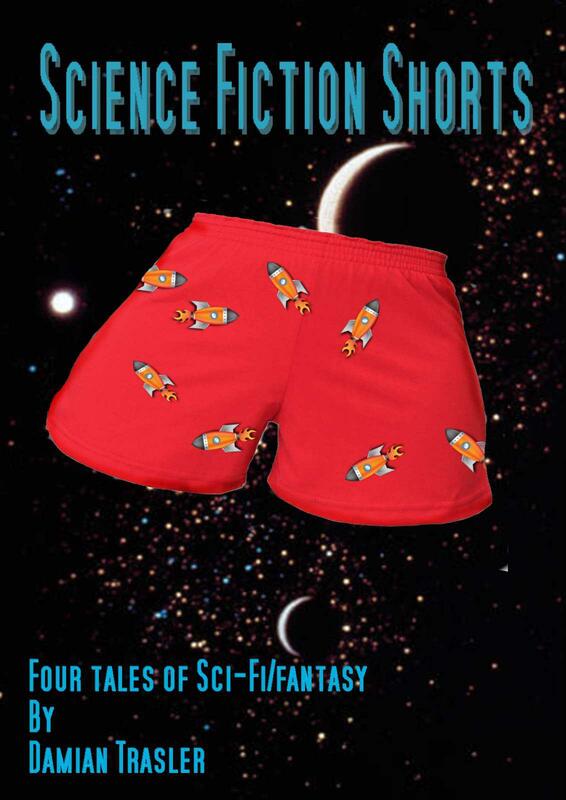 Science Fiction Shorts is available at the Kindle Store. I hear that one of the advantages of this format is that it allows the author to quickly and easily rewrite whatever needs to be corrected. Here’s something that should be: the book begins with a Calibri typeface then, for no apparent reason, in the middle of a story it switches to Times New Roman, and then back and forth a few more times. Appreciate the style and tone as well as the honesty of your review–no syrup–just a quality review that is truly helpful to a potential buyer. Thanks much!